Barcelona forward Luis Suarez says he had no option but to nutmeg Paris St-Germain defender David Luiz twice as he scored two brilliant goals in Paris. Suarez easily cut inside ex-Chelsea player Luiz on his way to putting Barca 2-0 up before repeating the trick as he scored a stunning third goal. The former Liverpool striker said: "A striker is always looking for goals and the two moves came off for me. "I had to nutmeg Luiz twice because there was nothing else I could do." Suarez scored 31 goals in 33 Premier League appearances for Liverpool last season before completing his £75m move to Spain. And he took his tally to 17 goals for Barca this season - including 11 in his last 11 - with his double in Paris to put Barca on the brink of the semi-finals of the Champions League. After Neymar had put the Spanish side ahead Suarez struck his first goal of the night, threading the ball between Luiz's legs at pace, holding off a challenge from Maxwell and firing home. His second of the night was even better, again nutmegging Luiz before striding on and planting a shot into the top corner. A cautious Suarez said: "In football you never know what's going to happen. "They have so much quality and we need to be aware that this isn't over. It'll be a good game." Barcelona coach Luis Enrique said: "We were superior in midfield, were dangerous going forward and defended well as a team. It was a complete performance from us. "Luis Suarez was the Werewolf of Paris. "The injury to Thiago Silva and the entrance of a not completely fit David Luiz was an invitation for Suarez. Like a wolf seeing the full moon in the sky. 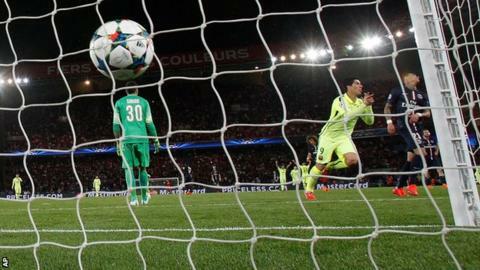 "The first half belonged to Barcelona, who showed PSG where the boundary of Europe's aristocracy lies. That is: 'You're very rich, fine, but that only goes so far. Now out of my way while I destroy you'. Oui Monsieur." A quirky statistic from Wednesday's Champions League quarter-finals is that all four managers once played in the same Barcelona team. Barca coach Luis Enrique, PSG manager Laurent Blanc, Bayern Munich boss Pep Guardiola and Porto coach Julen Lopetegui were all on the books at the Nou Camp during the 1996-97 season, when Bobby Robson was manager of the Catalan club. All four started the second leg of the Spanish Super Cup against Atletico Madrid at the start of the 1996-97 season. Barca lost the leg 3-1 but won the trophy courtesy of a 5-2 victory in the first leg. Also in that side was Albert Ferrer (former Cordoba coach), Sergi Barjuan (Almeria boss), Abelardo Fernandez (Sporting Gijon coach), Hristo Stoichkov (ex-Celta Vigo and Bulgaria coach) and Juan Antonio Pizzi (former Valencia manager). As an added bonus, Robson's assistant during that time was none other than current Chelsea boss Jose Mourinho.